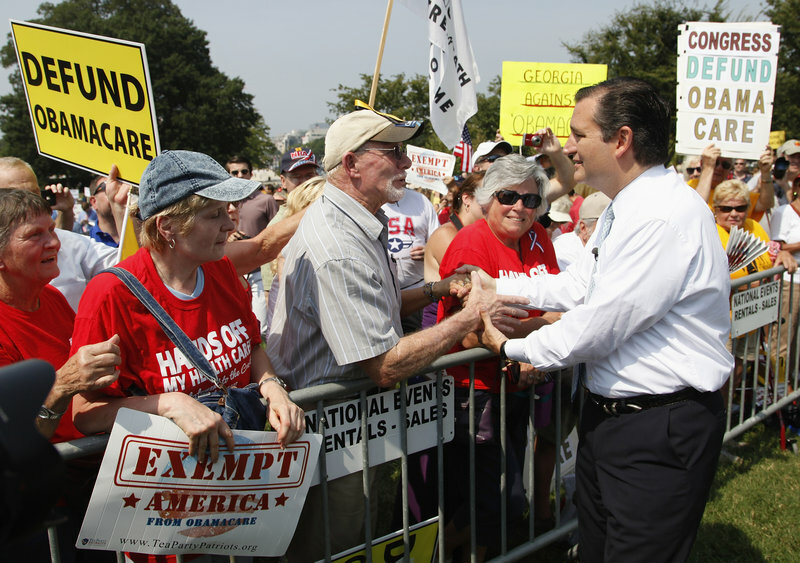 The re-energized group is gaining donations and data while rallying to hobble Obamacare. The clash in Congress over efforts to derail the health-care law backed by President Obama has lit up tea party groups across the country, re-energizing activists who had drifted away from the movement while intensifying the divisions tearing at the Republican Party. The standoff, which threatens to plunge the federal government into a financial crisis, has served as a rallying cry for a cadre of conservatives, who are bombarding lawmakers with phone calls, emails and social media messages backing a last-ditch effort to hobble the health-care law. It was the passage of that legislation, formally known as the Affordable Care Act and often derided by critics as Obamacare, that animated the movement when it first emerged in 2009. But the tea party’s renewed presence also poses serious political risks for Republicans, undermining efforts to broaden the party’s appeal. The movement itself could be blamed for contributing to Washington’s dysfunction if it helps set in motion a government shutdown next week or, later in October, a national credit default. The worsening Republican split was on display earlier this week when Sen. Ted Cruz of Texas, a tea party leader, held the floor for 21 hours with a marathon speech calling on Republicans to join his effort to defund the health-care law’s programs. The tactic infuriated many of his Republican colleagues but further energized the conservative base. The tea party movement rose to prominence in the early years of Obama’s presidency, helping drive a surge of conservative activism that helped flip control of the House to Republicans in 2010. At the time, according to CBS-New York Times polling, nearly a third of Americans considered themselves tea party supporters. The movement’s popularity, though faded, shows signs of growing again: A quarter of Americans in a new CBS-New York Times survey between Sept. 19 and 23 said they support the tea party, up four points from two weeks earlier. The movement exerts substantial sway over the Republican leaders in the House, who backed an effort to strip funding for the Affordable Care Act’s implementation in a budget bill passed last week. The Democratic-controlled Senate stripped out the health-care portion Friday and sent it back to the House — setting the stage for a potential government shutdown Tuesday. “House Republicans are so concerned with appeasing the tea party that they are willing to shut down the government,” Obama said in a statement Friday delivered at the White House. The movement’s central role in the political debate follows a 2012 election in which the tea party appeared to lose steam, with activists largely uninspired by the presidential race between Obama and Republican candidate Mitt Romney. “Mitt Romney and the tea party were never a perfect fit,” said Matt Kibbe, president of FreedomWorks, a leading tea party organization. The Affordable Care Act, which seeks to extend health coverage to millions of uninsured Americans, is viewed by tea party activists as a dangerous expansion of government. They fear it will reduce their choices of medical providers and burden the weak economy. Democrats note the program is modeled in part on a system that Romney put in place in Massachusetts, where he was governor. Much of the recent tea-party activity has been spurred on by Washington-centered groups such as FreedomWorks, Heritage Action for America and the Senate Conservatives Fund, a political action committee started by former U.S. senator Jim DeMint. Activists have used the defund effort to expand their e-mail lists and solicit donations. As of Friday afternoon, the “Don’t Fund It” website run by the Senate Conservatives Fund had almost 2 million signatures — a valuable database of potential supporters. “To elect true conservative leaders, you have to have money to do that,” said Matt Hoskins, executive director of the PAC, which has spent about $2 million on ads urging lawmakers to defund the health-care law. The sense of urgency was evident during two recent conference calls that the Tea Party Patriots group held with Republican allies in Congress such as Cruz, Sen. Mike Lee of Utah and Rep. Tom Graves of Georgia. More than 60,000 activists listened in. In meetings, activists swap claims that health-care premiums have gone up or that businesses are cutting employee hours to avoid providing health-care coverage under the law. In August, large crowds turned out for a series of Defund Obamacare town hall meetings that Heritage Action held around the country.